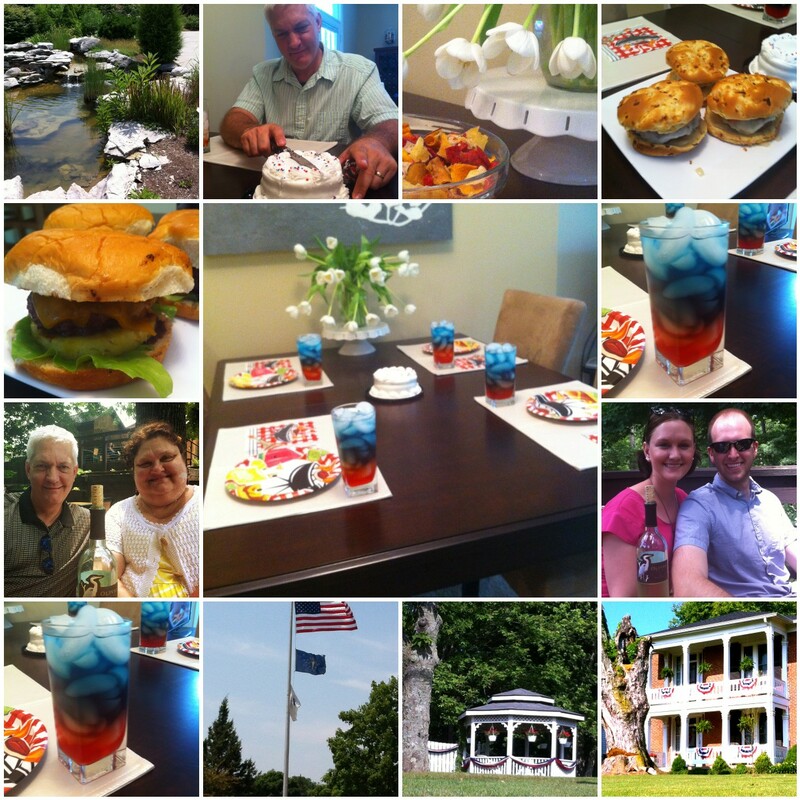 We were able to keep our annual Memorial Day Cook-Off by having Bob and me travel to Bloomington over Memorial Day. 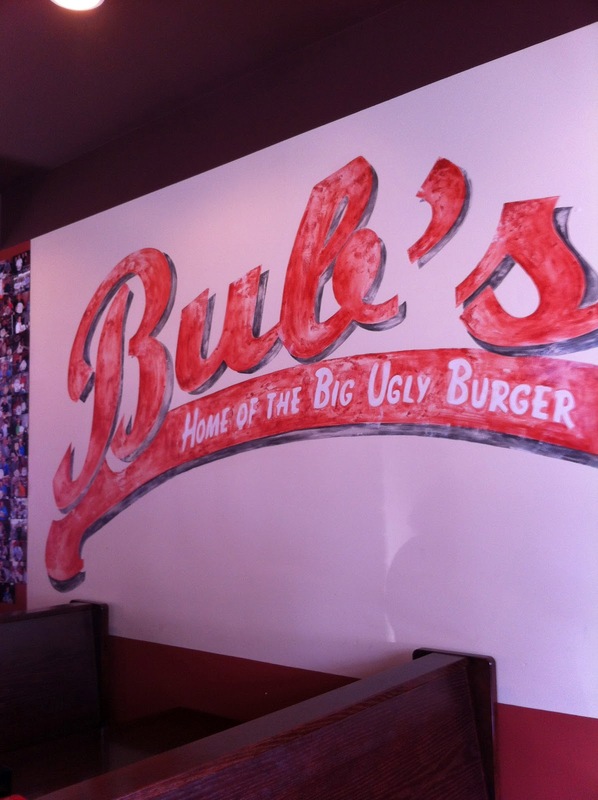 We celebrated Bob's birthday with a trip to Bub's Burgers. Huge and yummy! We spent some time at the apartment playing with Huxley and catching up on each other's lives. We also did a bit of shopping for Ashley's upcoming Ecuador trip. We watched a lot of Missouri Softball, too! 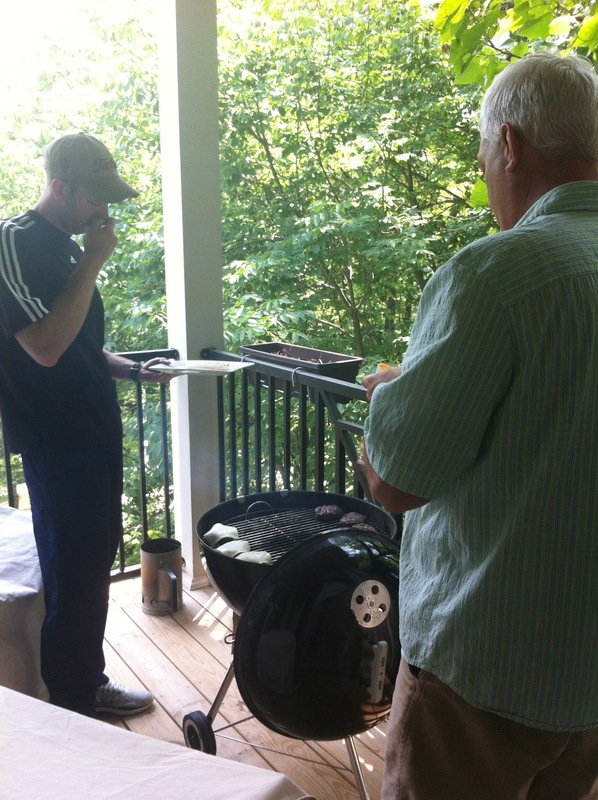 On Monday we planned our cookout. Ashley and I decided on making an Island Burger and Eric and Bob decided to make a Brandy Onion Burger. We went shopping at the local Krogers and picked up what we needed. We each formed our own patties and seasoned them and then Eric and Bob grilled them. Ashley and I made the drinks and set the table. We did a pinterest drink with the different layers of red, white and blue. It even tasted good! Form hamburger patties, salt and pepper, grill until desired doneness. Carmelize a slice of pineapple in a skillet with some teriaki sauce until browned. Open a Hawaiian roll, toast on grill. Spread mayo on the bottom bun. Spreak more teriyaki sauce on the top bun. Put slices of cheddar on the hot hamburger. Layer: bottom bun, lettuce leaf, pineapple ring, hamburger, cheese teriyaki sauce, top bun. Carmelize chopped onions in brandy and butter. Cook until softened and glazed. Put slices of Havarti cheese on to melt. It was unanimous that the Island Burger was the perfect summer burger with the sweetness and coolness of the pineapple ring but we are all eager to try the Brandy Burger at a tailgate! The burgers sound divine! What was the red white and blue drink? And who is Huxley? Did I miss something? The burgers sound divine! What was in the red, white and blue drink? And who is Huxley? Guess I need to catch up! Always a treat to pop in for a quick hello! Happy June! Ohhh that sounds so good! I briefly considered trying the red white and blue drink, but didn't have a dispenser. Didn't think to use just a glass! What a fun, creative time for you all to hang out. 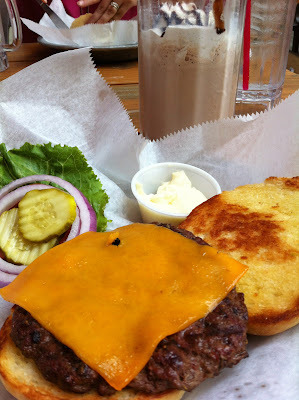 I'm soooo in the mood for a burger.